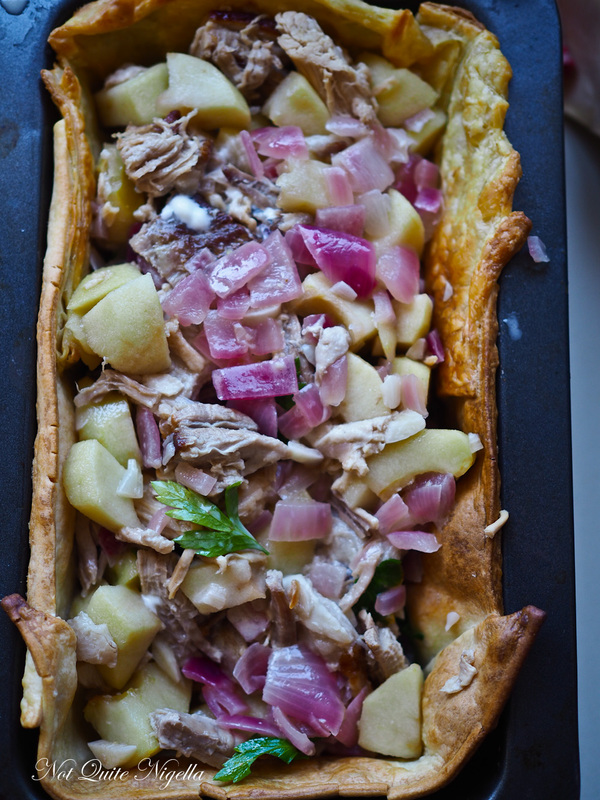 Although this pie recipe is not for a quick weeknight dinner, I hope you'll give this a go on a weekend when you're feeling leisurely and unhurried. That is, on a day when the biggest task is deciding what book to read or what show to watch during a yawning stretch of time. 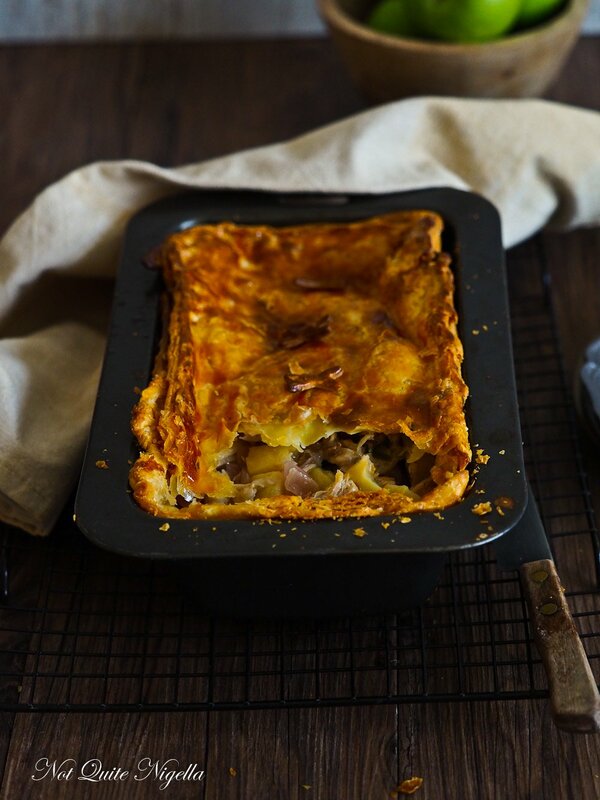 This divine pie is filled to the brim with meltingly soft pork belly and huge chunks of soft apple with a buttery puff topping. 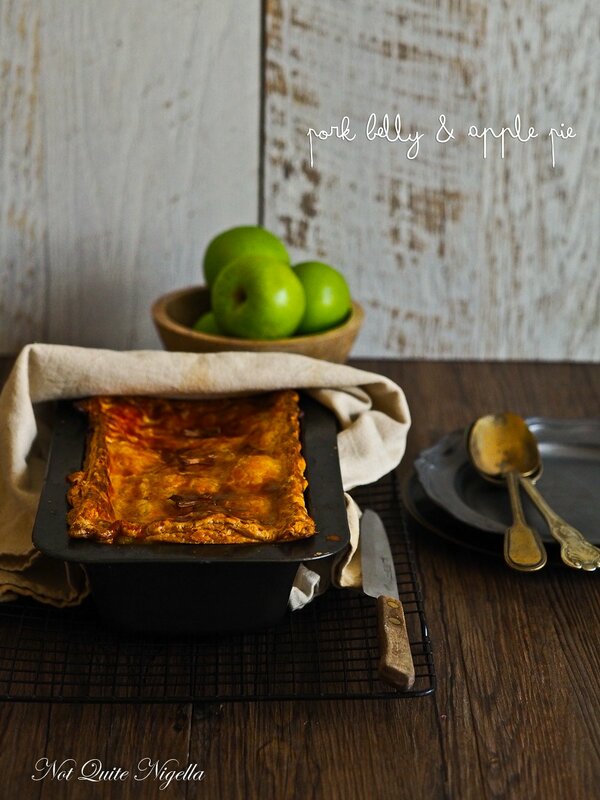 The idea for this pie came from a recent visit to Queenstown's Fergbaker. They had a pork belly and apple pie on the menu and I had to try it. 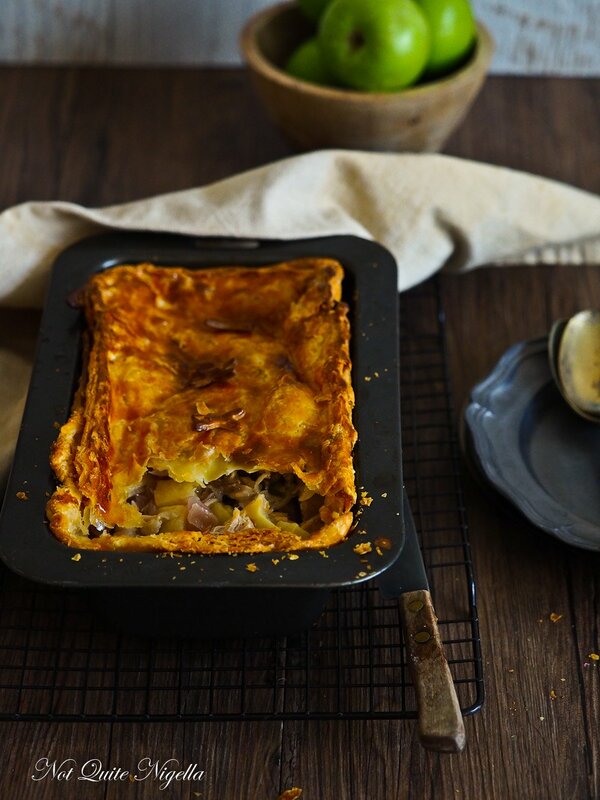 Unless you're British, pork isn't the usual filling for a pie; at a guess I'd say a beef pie for Australians. But once I sank my teeth into the pie I wondered why it wasn't. 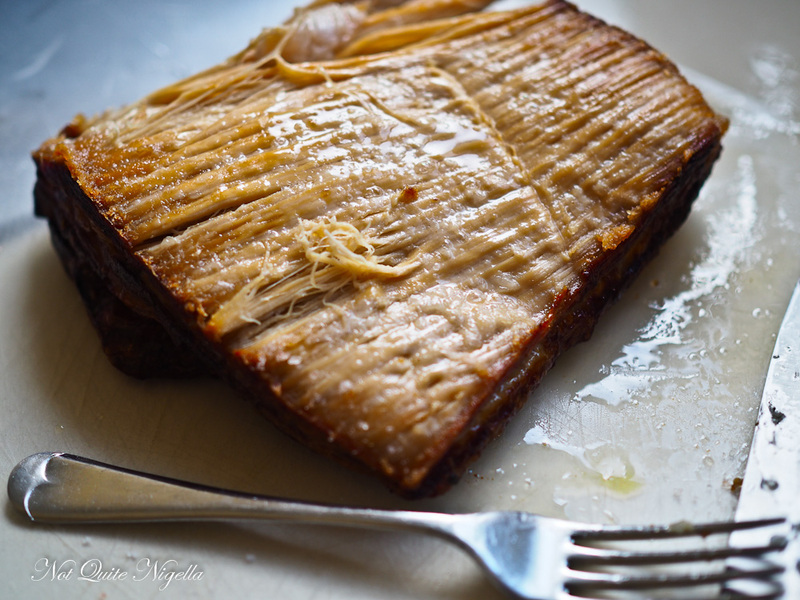 The pork belly chunks melted in my mouth and the large chunks of soft apple gave it a sweet, ever so slight tartness. I had to make this pie again. I had to eat this pie again. I'm not sure what was in the Fergbaker pie. There didn't appear to be a lot of spices that I could taste, it was rather mild and the star was really the texture. To mine I added some bay leaves and herbs as well as some cider just to give it a bit more vigour. I kept the apples chunky, perhaps even more chunky than theirs but I stubbornly think that this works. Pork belly is a luscious meat and you need that soft but not mushy apple to stand up to it. This is the sort of pie where you eat every last scrap and crumb it's that good. My sometime vegetarian friend Laura observed me eating one day. She pointed out that I eat in a certain way. I try everything separately and then put them all together. After I've had my sample tastes then I do something else. "You pick out the best bits," she said. I also tend to eat relatively quickly, not quite the leisurely slow pace. Pop, chew and swallow! I guess that is true, and to a certain extent I try and pick out the best of life. Life is too short to eat or do anything that you don't love, especially for a prolonged time. And I promise that although this pie may take a while to make, it is absolutely worth the effort. And there are only good bits to this pie too! So tell me Dear Reader, what is your eating style? Do you tend to go for the best bits or are you an overall finisher? Do you think that life is too short? Step 1 - First cook the pork belly. Preheat oven to 150C/300F. Place the belly skin side up in a snug baking tray and pour 2 cups of the chicken stock around it. Roast uncovered for 1 hour. Then pour more of the chicken stock around it as some of it will have evaporated and place a sheet of oiled foil on top and roast for 1.5 hours covered. Step 2 - Increase heat to 220C/440F. If you want crisp crackling, score the rind (it won't score deeply so don't worry) and then rub salt all over the rind. Place the pork belly on a rack and roast for 40 minutes. Step 3 - Add some oil to a small frypan. While the pork is roasting, saute the onions and garlic until translucent on medium high heat. Add cider or white wine, apples, sage and bay leaves and cook off the alcohol for a few minutes. Remove from the heat and allow to cool. 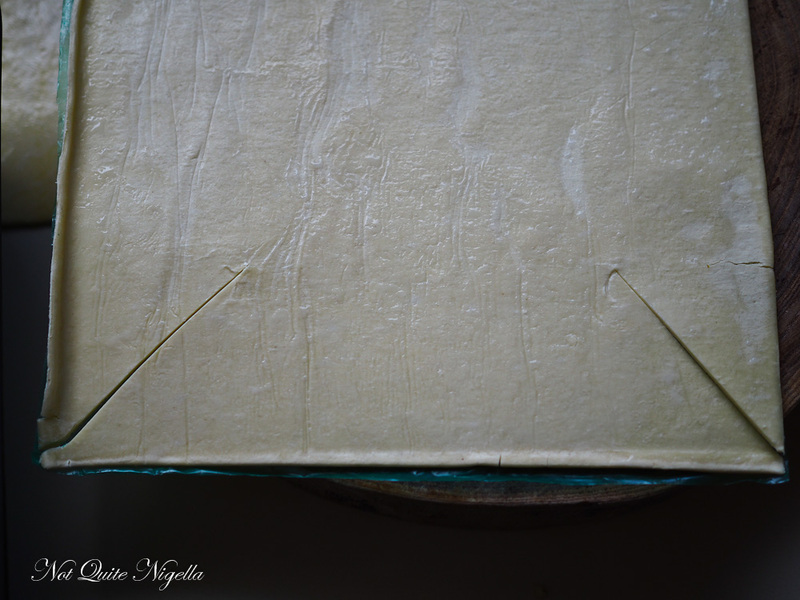 Step 4 - While it is cooling, line a loaf tin with the shortcrust pastry just cutting the corners as shown. You can save these scraps to cut out patterns on top. Dock with a fork and place in the fridge or freezer. Step 5 - Reserve the stock in the bottom of the pan. 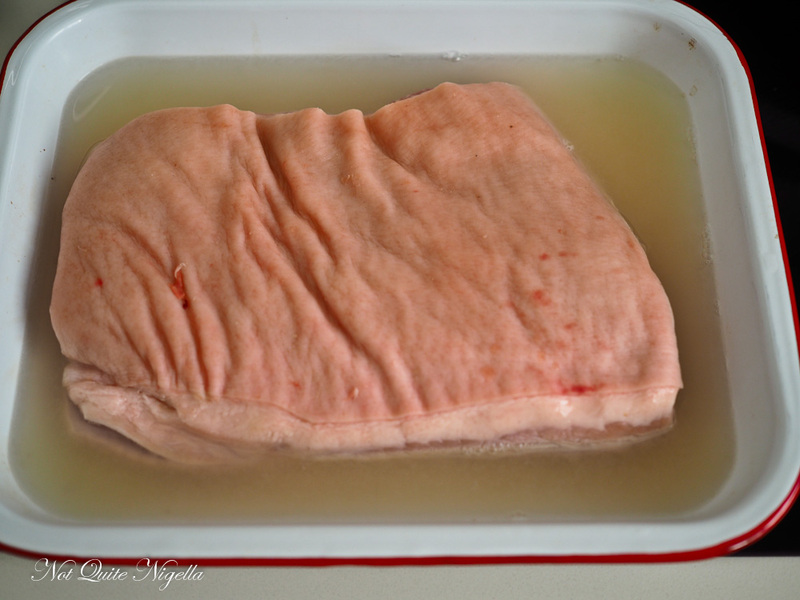 Remove the crackling from the pork and cut into pieces (to snack on). Most of the pork you can just pull apart from forks. Allow to cool and mix with the onion mixture. Season with salt and pepper to taste. Toss the mixture in the flour with 1/3 cup of the stock. Step 6 - Bake the pastry base on 220C/440F for 10 minutes. Then place the cooled filling and top with the puff pastry layer. Brush with egg yolk mixture and bake for 25 minutes. recipeJuicy, Juicy Jamaican Jerk Pork Ribs & Coconut Rice!